Show 61, February 15, 2013: Host Jet Tila and Producer Andy Harris. 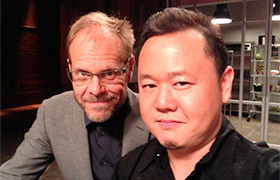 Food Network’s “Cutthroat Kitchen” with host Alton Brown is back on Sunday nights for Season 2. Our own Chef Jet Tila is the most frequently appearing solo judge on this tough competition show that requires strategy as well as cooking chops. Look for Jet’s new episodes starting in February. Thanks to all of our generous listeners who attended Chef Carla Hall’s Culinary Concert to benefit The James Beard Foundation at Zov’s Bistro in Tustin on Feb. 9th. Carla and guest MC Sherry Yard had the group thoroughly entertained with Carla’s demo of her Swamp Thing recipe which is from her new cookbook. It’s a braised pork shoulder in a smoked pork and corn broth. America’s own master Mexican cooking authority, Rick Bayless of Topolobampo and Frontera Grill, is with us. He’s the menu-maker for the fashionable new Red O restaurant in Fashion Island in Newport Beach. It’s the 30th Anniversary of the legendary Grill on The Alley in Beverly Hills. We’ll celebrate with the founder. Cochon 555, a pork spectacular, returns to Santa Monica this month. We’ll tell you all about it. How about a fast food stand serving quality roast beef sandwiches using the very best ingredients? It’s run by fine dining chefs! Orange County Restaurant Week launches February 23rd. We’ll have a preview with one of the colorful participating executive chefs. Segment Seven: Bob Spivak, President, CEO, and Co-Founder, Grill Concepts, Inc.
Top Round Roast Beef opened in the extensively remodeled space of a former donut shop at the busy corner of Olympic Blvd. and La Brea Avenue last June. The theme is top quality roast beef sandwiches where the beef is sliced to order. On the menu is a variety of quality roast beef sandwiches served on a butter-toasted bun with natural au jus. The beef is impressively sliced to order. Also on the small menu are curly French fries cooked in beef fat for maximum flavor, milkshakes and St. Louis frozen custard. The owners have impressive culinary credentials from places including Red Medicine, 800 Degrees, and Curtis Stone’s restaurants. Restaurant investor Jamie Tiampo (who is also the owner of See Food Media in New York) joins us along with Chef Steven Fretz (previously executive chef for Curtis Stone’s restaurant group) to explain the concept. When it comes to possessing a vast knowledge of the regional cooking of the various states in Mexico the recognized “el jefe” in the United States is Chicago’s Rick Bayless. Locally he’s probably best known for the PBS’s series “Mexico – One Plate at a Time” (now starting its 9th award-winning season) and from Bravo’s “Top Chef Masters.” In Chicago he’s a local culinary celebrity for his highly popular restaurants including River North’s Topolobampo and Frontera Grill. Chef Bayless has created the menu for the recently opened, and much talked about, highly designed Red O in Fashion Island, Newport Beach. It’s basically his contemporary take on Oaxacan fare and other culinary regions of Mexico. Certain dishes are exclusive to Fashion Island and the tequila list includes 100 selections. Chef Bayless offers tips for preparing the perfect guacamole. The new season of his hit PBS series takers us to Oaxaca, one of his favorite culinary regions in Mexico. We’ll see the “Day of the Dead” celebration Oaxaca-style. Cochon 555 (a celebration of heritage pork) returns to Los Angeles on its 2014 cross-country tour at The Fairmont Miramar Hotel on Sunday afternoon, February 23rd. Over 11 tons of heritage pork raised by family farms will be served across the country in the nose-to-tail touring culinary competition. 2014’s competing chefs include Host Chef Ray Garcia of Fig Restaurant, Christian Page of Short Order, Jason Neve of B&B Ristorante, Ray England of Craft, and Brian Howard of Comme Ca. Each chef prepares a maximum of six dishes created from one whole heritage pig. Our own Jet Tila will be preparing an additional late-night sixth pig for the After Party. The OC’s most anticipated, and delicious, dining event, Orange County Restaurant Week, returns from February 23rd to March 1st. Diners will have the opportunity to enjoy the wide spectrum of dining options in the County at special prices for prix-fixe menus for both lunch and dinner. Over 100 restaurants are part of Orange County Restaurant Week. One of the featured restaurants is Santa Ana’s Chapter One: The Modern Local. Chef Jason Montelibano (aka Chef Chicken Wing) joins us to talk about his menu. Given his Filipino ancestry he’s incorporated a few contemporary Filipino touches into his menu. Chef Jason won Riveria Magazine’s “To Live and Dine” chefs’ challenge event @ SoCo last year with his Lamb & Gnocchi dish. 30 years ago dining history was made in Beverly Hills (a tough city for restaurant longevity) with the launch of The Grill on the Alley which is better known as The Grill. It soon evolved into a high profile business destination for lunch for the power brokers of Hollywood. Where your table was signified your status in the Entertainment Business. At night it became a destination for affluent locals with a very loyal following. Unusually for the time pretentiousness was never part of the gameplan. It also was the start of a significant restaurant company with three successful concepts. Grill Concepts, Inc. continues to flourish to this day. Public School is the newest concept (with a sense of humor) with locations in Downtown Los Angeles, Culver City and Thousand Oaks. Northern California is next and more locations on the horizon. It’s a bar & restaurant gathering spot. Founder Bob Spivak, a second generation restaurateur with a love for the hospitality business, joins us to share the fascinating story. Chef Jet has been in New York twice over the last two weeks and has enjoyed some standout dining adventures along the way. Jet shares the details of his meal at Chef April Boomfield’s Spotted Pig (no reservations) in the West Village. This was one of the country’s first gastropubs. It’s still a scene over ten years later. Jet also visited Ippudo, a well-known Japanese ramen shop and a personal favorite.